The cotinine blood test measures the cotinine & nicotine blood levels. What is a cotinine blood test? The cotinine blood test measures the cotinine and nicotine blood levels. Why is a cotinine blood test important? The cotinine blood test is useful for screening, as part of smoking cessation programs and detection of other exposures to nicotine. This Cotinine Blood Test is a blood test. The cotinine blood test, also known as a cotinine test, cotinine lab test and nicotine blood test, measures the nicotine and cotinine blood levels. Cotinine is a compound found in the body that is a breakdown product of nicotine. Cotinine can act on acetylcholine receptors just like nicotine but typically has a weaker effect. Nicotine and cotinine exist in the blood after smoking and cotinine levels are commonly measured as a way to check for prior tobacco use. The cotinine blood test is useful in monitoring the success of a smoking cessation program and can also detect passive exposure to smoke as well as exposure to other sources of nicotine. Cotinine levels are generally under 8 ng/mL in nonsmokers. To get a cotinine blood test near you, order online and get your blood drawn at the selected Quest Diagnostics lab. Once the cotinine lab report is ready, it will be available for download. 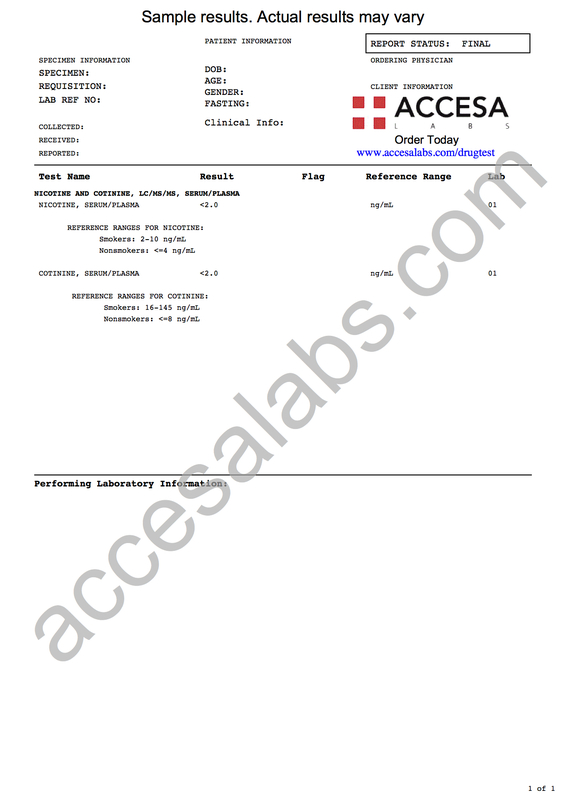 As can be seen on the sample cotinine blood test report, the nicotine and cotinine blood levels will be reported as numbers and can be compared against the reference ranges provided by the lab. The nicotine urine test is a good option for people who want a version of this cotinine test that utilizes urine testing. Cotinine testing is not part of standard drug tests. The 7 panel drug test and 10 panel drug test are better choices for general drug screening. Cotinine Blood Test at Guaranteed Prices.